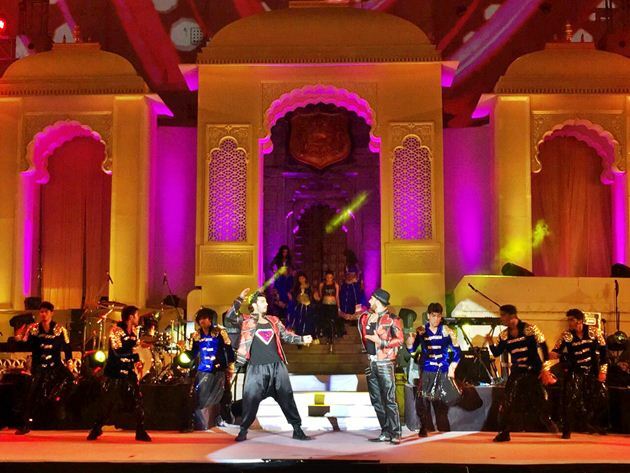 Wedniksha, the wedding division of Wizcraft planned, managed and executed the entertainment and stage decor for the grand wedding celebrations of Sanjay Hinduja and Anu Mahtani at Udaipur from Feb 10 to Feb 12. On Feb 10, a Welcome Dinner took place at Manek Chowk, the palace grounds of the The City Palace complex which is also part of the HRH Group of Hotels. The evening saw performances by Terence Lewis and former singer of Pussycat Dolls, Nicole Scherzinger. 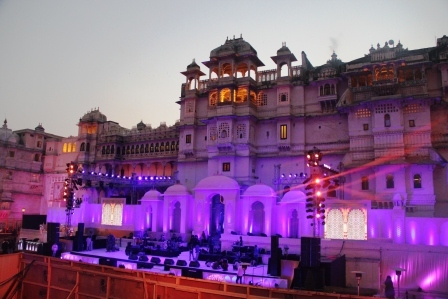 The stage decor created at the Manek Chowk was in tandem with the beautiful palace facade while also maintaining the beauty of the palace and incorporating the same in the stage design to accentuate the beauty of the heritage property. The entire facade of the Manek Chowk was mapped with projection and act related graphics were played on the facade to complement each act. 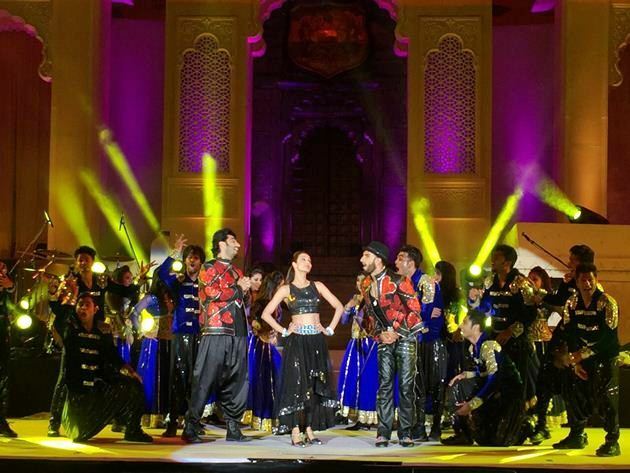 The next evening, the Sangeet took place at Manek Chowk which featured sensational dance performances by actors Malaika Arora Khan, Arjun Kapoor, Ranveer Singh. Malaika, Ranveer and Arjun put together a medley of 35 mins, where Arjun and Malaika joined Ranveer on the song ‘Tune Maari Entriyaan’ for the finale. The evening was closed by a heart-warming performance by singers Vishal- Shekhar. The grand Wedding & Reception took place on Feb 12 at Jagmandir Island Palace, a luxurious heritage palace of the HRH Group of Hotels. The dream wedding venue continues to make news year after year in the global glamour world for the exclusive regal experiences it offers. The highlight of the event was a power packed performance by none other than Jennifer Lopez! The wedding has proved to be one of the most talked about weddings of 2015. 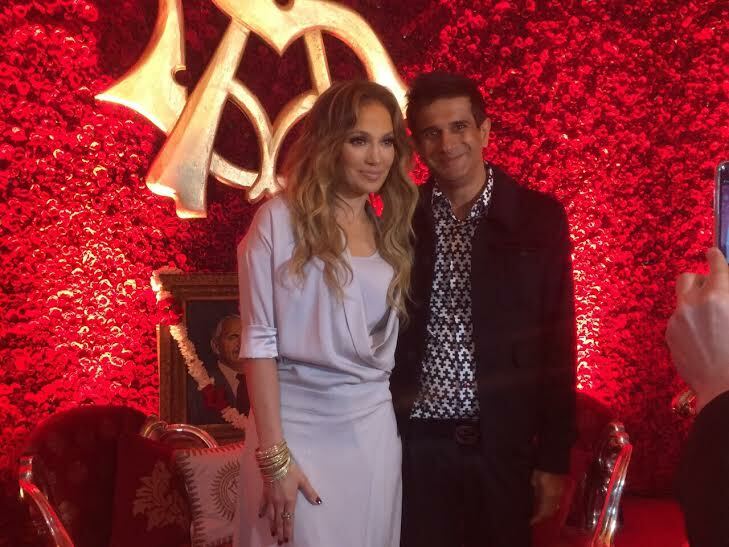 Wedniksha executed the challenging task of designing a set to match a world famous artist like Jennifer Lopez. The agency managed movement of all the equipment in boats as Jagmandir is located in the middle of a water body called Lake Pichola. Wedniksha also planned, managed and executed all the entertainment, fabricated all the sets, handled production of sound, light, video and rehearsals for all acts including those of Nicole Scherzinger, Jennifer Lopez, Malaika, Arjun Kapoor, Ranveer Singh, Terrence Lewis and Vishal Shekhar. Speaking on the choice of artists, Bhavnesh Sawhney, Director, Wedniksha explained, “We were given the task to coordinate, propose, manage all entertainment which is the heart of any wedding. Wedniksha has previously worked with Nicole Scherzinger at the ‘South African of the Year’ Awards in South Africa and Wedniksha was well familiar with the requirements and technical needs. Wedniksha, an initiative of Wizcraft, won the mandate to plan, manage and execute decor, entertainment, set design, technicals etc for the high profile wedding in Udaipur.